GREENFORD — West Branch’s girls basketball team didn’t have enough to match Akron Hoban’s might in a 35-21 loss to Akron Hoban on Saturday at the South Range Holiday Classic. Peyton Alazaus led the Warriors with six points. Grace Heath added five points. The Warriors fall to 8-2 and will host Alliance at 1:30 p.m. on Jan. 5. Hoban improves to 10-0. West Branch’s jayvee team bested Tusky Valley 42-38. WEST BRANCH SCORING: Carly Scarpitti 0-1-1, Grace Heath 2-1-5, Riley Tuel 1-0-2, Maddie Showalter 1-0-2, Anna Lippiatt 1-0-2, Peyton Alazaus 1-4-6, Jessica Bock 1-1-3. TEAM TOTALS: 7, 6-12: 21. HOBAN SCORING: Gooden-Wesley 3-4-10, Flannery 3-2-10, Brewer 4-1-9, Hutson 1-0-2, Roberts 1-0-2, Bentley 1-0-2. TEAM TOTALS: 13, 7-14: 35. Three-point goals: West Branch 1 (Heath), Hoban 2 (Flannery 2). 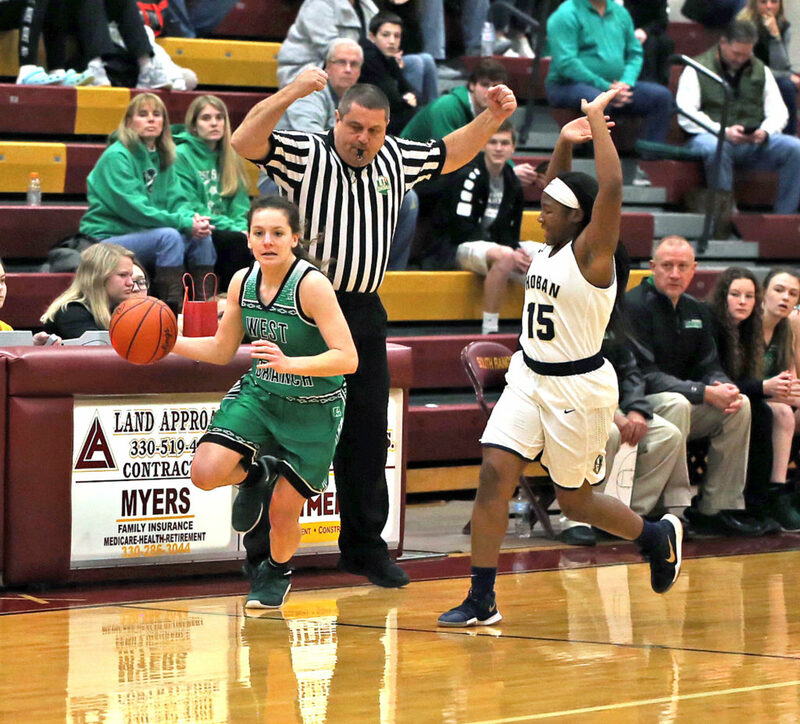 GREENFORD — In a game featuring two of the area’s best girls basketball teams, Youngstown Ursuline found a way to down the Salem Quakers, 48-46 on Saturday night in finale of the South Range Holiday Classic. Salem falls to 8-4 and will be at Marlington on Jan. 5. University of Pittsburgh recruit Dayshanette Harris had 27 points to lead the Irish. Kyla Jamison paced Salem with 23 points and eight rebounds. Ellie Davidson added 11 points, five rebounds and four assists. Echo Mayer-Kutz contributed six points and two assists. Salem’s jayvees beat Ursuline 56-23. Abby Perry contributed 16 points and eight steals. Alexis Miller added 12 points and seven rebounds. Late Friday night the Salem girls basketball team beat South Range 48-44 in the final game of the day at the South Range Holiday Classic. The Quakers were led by Echo Mayer-Kutz with 18 points, five rebounds, five blocks, three steals and two assists. Kyla Jamison added 16 points, seven rebounds, and two assists. Annie Davidson contributed seven points and three assists along with a key offensive rebound down the stretch. Salem’s jayvees were 20-15 winners on Friday. Abby Perry had 11 points for the Quakers. URSULINE SCORING: Dayshanette Harris 11-3-27, Rachel Fabry 1-1-3, Jamie Nelson 1-0-2, Cara McNally 1-0-3, Destiny Goodnight 0-2-2, Anyah Curd 4-1-9, Lindsay Bell 1-0-2. TEAM TOTALS: 19, 7-13: 48. SALEM SCORING: Casey Johnson 0-0-0, Taylor Troy 1-0-2, Ellie Davidson 4-3-11, Paige Bailey 0-0-0, Hayden Carner 0-0-0, Echo Mayer-Kutz 3-0-6, Jaden Hamilton 2-0-4, Kyla Jamison 8-6-23. TEAM TOTALS: 18, 9-11: 46. Three-point goals: Ursuline 1 (McNally), Salem 1 (Jamison). SALEM SCORING: Casey Johnson 0-0-0, Taylor Troy 1-0-3, Annie Davidson 3-1-7, Ellie Davidson 1-0-2, Paige Bailey 0-0-0, Hayden Carner 0-0-0, Echo Mayer-Kutz 7-4-18, Jaden Hamilton 0-2-2, Kyla Jamison 7-1-16. TEAM TOTALS: 19, 8-11: 48. SOUTH RANGE SCORING:Izzy Lamparty 8-0-16, Bri Modic 3-0-7, Bree Kohler 3-3-9, Marlaina Slabach 2-0-6, Lexi Giles 2-2-6. TEAM TOTALS: 18, 5-11:44. Three-point goals: Salem 2 (Troy, Jamison), South Range 1 (Modic). GREENFORD — South Range’s girls basketball team got 21 points from Izzy Lamparty in a 58-43 win over Hathaway Brown on Saturday at the South Range Holiday Classic. Bri Modic added 14 points for the Raiders. HATHAWAY BROWN SCORING: Duval 5-4-14, Lux 2-0-4, Warcaba 6-6-19, Lux 1-0-2, Kennedy 2-0-4. TEAM TOTALS: 16, 10-12: 43. SOUTH RANGE SCORING: Izzy Lamparty 8-5-21, Emily Irons 1-0-3, Bri Modic 4-3-14, Bree Kohler 4-1-9, Lexi Giles 4-3-11. TEAM TOTALS: 17, 12-24: 58. Three-point goals: Hathaway Brown 1 (Warcaba), South Range 4 (Modic 3, Irons). BERLIN CENTER–Led by a double-double from Dani Vuletich, Western Reserve walloped Lisbon 72-28 in girls basketball action Saturday. Vuletich finished with 17 points and 14 rebounds as Reserve improves to 9-1 overall. Also for Western Reserve, Alyssa Serensky had 15 points and three steals, Laura Sigworth had 12 points and three assists and Kennedy Miller had nine points and eight assists. 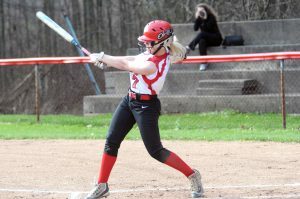 Olivia Pater also had three steals. For Lisbon, Chloe Smith had 10 points and four rebounds. Western Reserve won the jv game 41-27. Fro Lisbon, Madison Haifley and Bryanna VanGiesen each had eight points for Lisbon. Emma Heater had 16 points for Western Reserve. Western Reserve takes on Jackson-Milton Thursday. Lisbon is at Jackson-Milton Thursday. LISBON SCORING: Izzy Perez 1-1-3, Cadee Johnson 0-0-0, Hailee Carpenter 1-0-2, Chloe Smith 4-1-10, Callie Steed 0-2-2, Maddie Liberati 2-0-4, Corinne Freeman 3-0-6, Tabby Ketchum 0-1-1. TEAM TOTALS: 11, 5-10: 28. WESTERN RESERVE SCORING: Brooke Morris 2-0-4, Maddy Owen 1-1-3, Laura Sigworth 5-0-12, Kennedy Miller 3-0-9, Olivia Pater 2-0-6, Erica Dezee 1-0-3, Dani Vuletich 5-7-17, Alyssa Serensky 4-4-15, Emma Heater 0-0-0, Morgan Donithan 1-0-3. TEAM TOTALS: 24, 12-17: 72. Three-point goals: Lisbon 1 (Smith), Western Reserve 12 (Miller 3, Serensky 3, Sigworth 2, Pater 2, Dezee, Donithan). MINERVA — Minerva’s girls basketball team downed Claymont 54-18 on Saturday. Addie Rhodes had 17 points and six rebounds for the 7-2 Lions. Minerva won the jayvee game, 29-19. CLAYMONT SCORING: Henry 1 0-0 2; Edwards 1 0-0 2; Hostetler 1 0-0 2; Norman 5 0-2 10; Seibert 1 0-0 2; Gibson 0 0-2 0. TEAM TOTALS: 9, 0-4: 18. MINERVA SCORING: Foutz 1 2-2 4; Yankovich 1 1-2 3; Kendrick 3 1-2 7; Imler 4 1-2 9; Wayts 4 0-0 10; Miller 1 1-2 3; Rhodes 7 3-4 17; Brunner 0 1-2 1; TOTALS: 21, 10-16: 54. Three-point goals: Minerva 2 (Wayts 2).